We're always striving to help webmasters build outstanding websites, and in our latest release we have two new features: Content analysis and Sitemap details. We hope these features help you to build a site you could compare to a fine wine -- getting better and better over time. To help you improve the quality of your site, our new content analysis feature should be a helpful addition to the crawl error diagnostics already provided in Webmaster Tools. Content analysis contains feedback about issues that may impact the user experience or that may make it difficult for Google to crawl and index pages on your site. By reviewing the areas we've highlighted, you can help eliminate potential issues that could affect your site's ability to be crawled and indexed. This results in better indexing of your site by Google and other search engines. Selecting "Duplicate title tags" displays a list of repeated page titles along with a count of how many pages contain that title. We currently present up to thirty duplicated page titles on the details page. If the duplicate title issues shown are corrected, we'll update the list to reflect any other pages that share duplicate titles the next time your website is crawled. Also, in the Title tag issues category, we show "Long title tags" and "Short title tags." For these issue types we will identify title tags that are way too short (for example "IT" isn't generally a good title tag) or way too long (title tag was never intended to mean <insert epic novel here>). A similar algorithm identifies potentially problematic meta description tags. While these pointers won't directly help you rank better (i.e. pages with <title> length x aren't moved to the top of the search results), they may help your site display better titles and snippets in search results, and this can increase visitor traffic. In the "Non-indexable content issues," we give you a heads-up of areas that aren't as friendly to our more text-based crawler. And be sure to check out our posts on Flash and images to learn how to make these items more search-engine friendly. 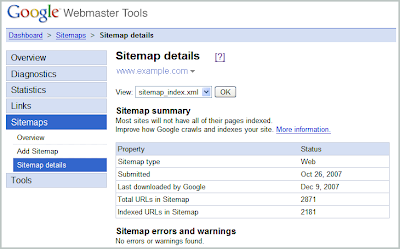 If you've submitted a Sitemap, you'll be happy when you see the additional information in Webmaster Tools revealing how your Sitemap was processed. You can find this information on the newly available Sitemap Details page which (along with information that was previously provided for each of your Sitemaps) shows you the number of the pages from your Sitemap that were indexed. Keep in mind the number of pages indexed from your Sitemap may not be 100% accurate because the indexed number is updated periodically, but it's more accurate than running a "site:example.com" query on Google. The new Sitemap Details page also lists any errors or warnings that were encountered when specific pages from your Sitemap were crawled. So the time you might have previously spent on crafting custom Google queries to determine how many pages from your Sitemap were indexed, can now be spent on improving your site. If your site is already the crème de la crème, you might prefer to spend the extra free time mastering your ice-carving skills or blending the perfect eggnog. Sitemaps are an excellent way to tell Google about your site's most important pages, especially if you have new or updated content that we may not know about. If you haven't yet submitted a Sitemap or have questions about the process, visit our Webmaster Help Center to learn more. We love expanding our product to help more people and in their language of choice. We recently put in effort to expand the number of Webmaster Tools available languages to Czech and Hungarian, in addition to the 20 other languages we already support. We won't be stopping here. Our desire to support even more languages in the future means that if your language of choice isn't currently supported, stay tuned -- there'll be even more supported languages to come. We always love to hear what you think. Please visit our Webmaster Help Group to share comments or ask questions.